If you liked that Daddio, wait until they reach the 50's - Man, you'll love Rock'n'Roll! 20's + 50 = Punk Rock Jazz! A long drought of gig-going (my first this year!) ended on Saturday when I went to see The Outcasts at The Amersham Arms, New Cross. Having heard very little material by them, I wasn't quite sure what to expect. Opening with a cover version (1969) didn't bode well, but it was all good from then on. Decent punk/punkabilly. Didn't know any of the songs but me and a reasonable sized audience enjoyed it. Thanks for the review sb! 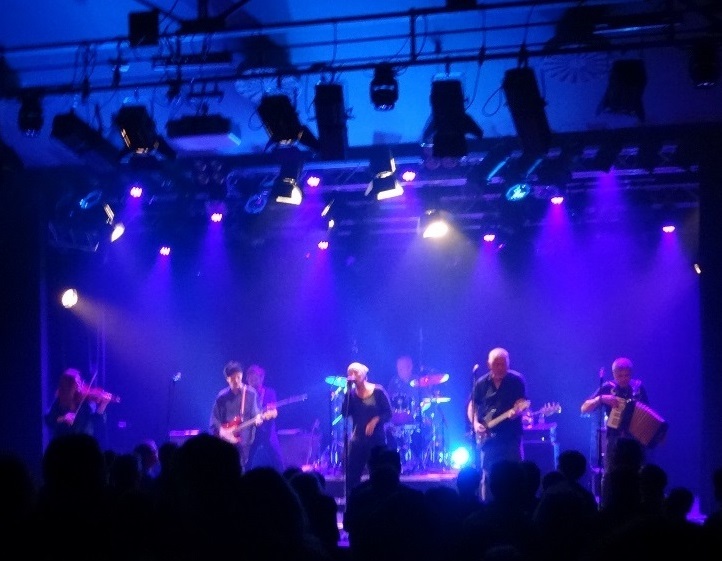 I'm still planning to see The Mekons on Saturday. Maybe a smaller club gig w/ Sally Grayson (Black Swift) before that? Maybe even before that my niece playing with her school band tonite? If you wanna hear me swearing a lot, give me heavy snowfall at the start of my drive to a gig! Trying to spare me the parking fee, I looked for a free (in every sense of the word) space behind the cemetery (nice place btw, looks a bit like the "Phantasmagoria" album cover) and walked over to the "franz k" (it used to be a French cinema, i.e. a good place for gigs, because you have a good view of the stage at the back, from where I took the pic). Soon after I paid, I saw Lu Edmonds in the foyer, but he seemed in deep conversation with someone, so I didn't want to interrupt. In the audience I also spotted Mr Weber, who is the co-owner of Glitterbeat Records. 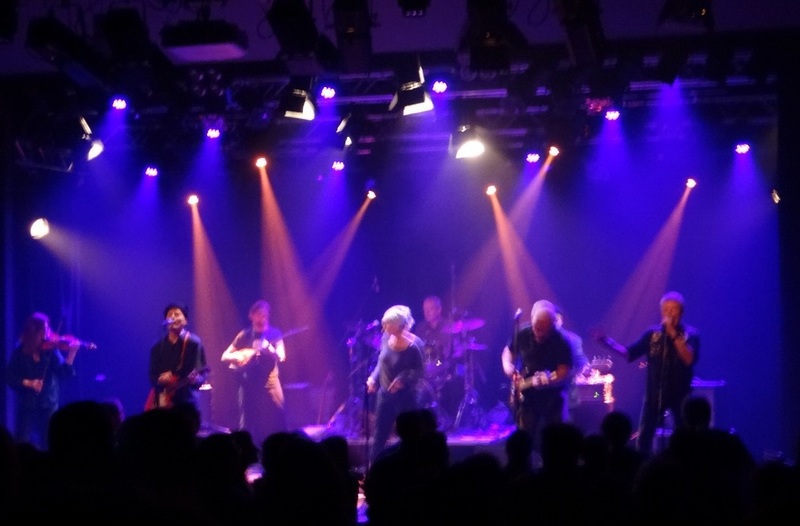 The Mekons were great right from the first song ("Lawrence of California"), 8 people on stage playing all kinds of styles from folk to reggae and punk/rock'n'roll. I knew only a few songs ("Millionaire"), but enjoyed it nevertheless! Lu played his "saz" plus a bit of electronic noise (John Langford: "Lu Edmonds, I don't know what he does there, but I love it"). All players/singers sounded good with what they did. Afterwards I bought the new album, which is quite nice to listen to in the car! Sounds great Uli - glad you enjoyed it and overcame the snow! 'The Men That Will Not Be Blamed For Nothing' supported by 'Louise Distras' tonight in Camden. 'Red Flag 77', 'Smart Alex', 'Rue de la Mort' and 'The Threat' on Saturday in Ipswich. 'Buzzcocks' (with guest singers), 'Skids' & 'Penetration' at RAH in June. 'Half Man Half Biscuit' in Cambridge in September. ...and then the Skeggy festival in October. Eddie and the Hot Rods -'done everything we want to do' (not) farewell gig. Good but not great. some past members as expected but why on earth let Duncan Reid come on to sing one of your best songs (The Kids Are Alright). 2 members of 9 Below Zero joined them for another before performing 2 acoustic songs while the Rods took a break. The place was packed.